1. Someone's behavior or conduct: Generally, people are admired for their gentle demeanors or they are despised because of their cruel demeanors. Those with a haughty or unfriendly demeanor are generally not liked by other people. 2. 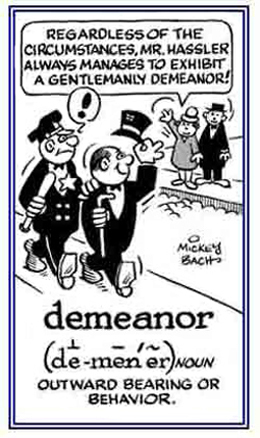 Etymology: from outdated Middle English demean, "handle, manage, conduct"; later, it meant, "behave in a certain way", from Old French demener, "to guide, to conduct; to live, or to dwell", from de-. 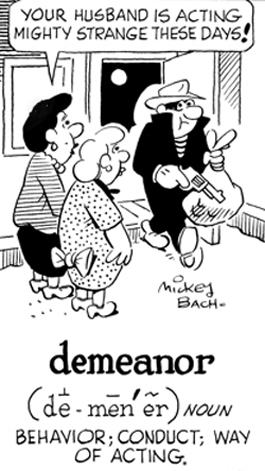 "completely" + mener "to lead, to direct"; from Latin minare, "to threaten". © ALL rights are reserved.